As cities in the Global North witness a spur of protests that deploy tactics of informal occupation on formal spaces, cities in India are increasingly seeing a push towards formalization of informal settlements through redevelopment policies. In Mumbai, the shift towards redevelopment begins post 1990s. Before the 1990s, slums were slated to be upgraded and improved in a manner similar to what’s been described in many posts on Latin American cities. By carrying out a comparison between housing policies pre and post 1990s this post attempts to chart out a shift in the States imagination of slum after liberalization. Until mid 1970s the State responded to the “slum problem” through a colonial policy of slum demolition and replacement by public housing. However the number of houses that the government built was abysmally lower than the number of slum houses it tore down and hence the removal of slum in one place only created a slum in a new place. 1970s and 80s saw a shift in the Indian governments perception of slums. During this period the World Bank began to fund Slum Upgradation (SUP), Slum Improvement (SIP) and Sites and Services programs (SSP) in Indian cities. World Bank economists, influenced by ideas of development critics like William Turner, criticized the state’s expensive public housing efforts and argued in favor of affordable, squatter settlements that could incrementally grow over time. They promoted a trinity of economic efficiency, “affordability – cost recovery – replicability” and more importantly – less government spending. This was instrumental in shifting the government’s view of the slum as a space of squalor, dirt and disease to accepting it as another model of housing that could be gradually serviced and brought to the same standard of infrastructure and amenities as the rest of the city. The right to residence for slum dwellers came to be mediated through “regularization” of the slum. The state distributed photopasses to residents which entitled them to alternative accommodations in case of demolition. In the meanwhile the state upgraded the infrastructure in the slum by providing water, electricity and drainage lines. The entitled slum dwellers, who now had some sense of security, often incrementally added rooms to their homes and rented them out for enterprise or residence. Hence, not only did regularization and SUP/SIP programs secure residence for the initial slum dwellers it also added affordable rental housing to the city. However, the slum was still stigmatized as an informal settlement that was “outside” the boundary of the formal city. After India’s adoption of liberalization polices in the 1990s, the slum housing schemes in Mumbai went through another round of change. In 1995 the State introduced a populist and ambitious Slum Rehabilitation Scheme (SRS). 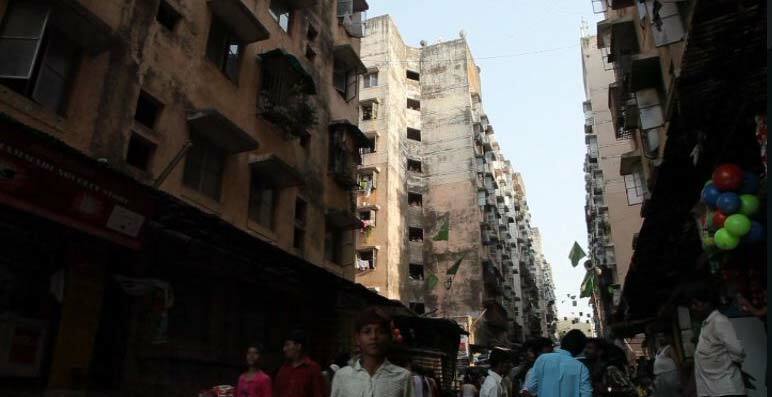 This scheme uses Mumbai’s high real estate values to provide the slum dwellers with “free housing” cross subsidized through market rate housing. For every 100 sq feet of slum housing that the developer provides he/she was allowed to build 75 sq feet of housing that can be sold in the open market. In addition to this expensive city land on which this slum sits is gifted to the developer free of cost. This is a very profitable model for the developer and it assures all slum families on the state electoral roles, on or prior to Jan 1st 1995, a home measuring 225 sq feet. 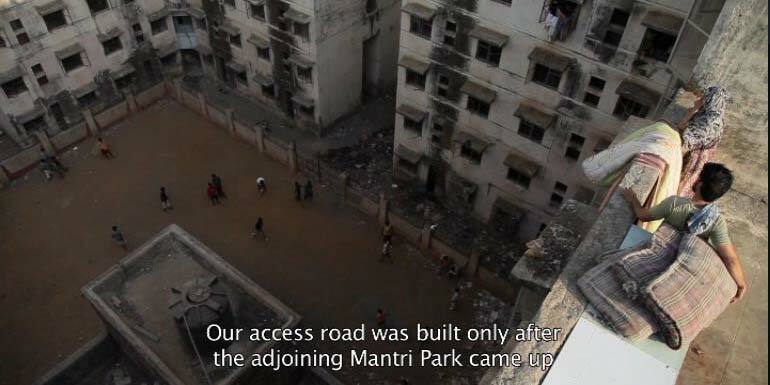 Through this process of redevelopment the informal space of the slum ceases to exist. The political society that was transgressing the boundary of legality by living in a slum gets awarded “formal ownership” of a 225 sq ft house. In this way the policy makes the entitled slum dweller a propertied, law abiding citizen and promises to lift the taboo associated with living in an “informal” slum. Needless to say; there is a lot of aspirational value that is attached to this kind of housing. The shift in the imagination of the slum. The slum improvement/upgrading policy in the 70s and 80s recognized the slum as complex spatial organism with multiple systems of tenure, typologies and community networks that had evolved over time. The slum was viewed as a cog in a larger process of urbanization that could not be easily replicated through formal planning. 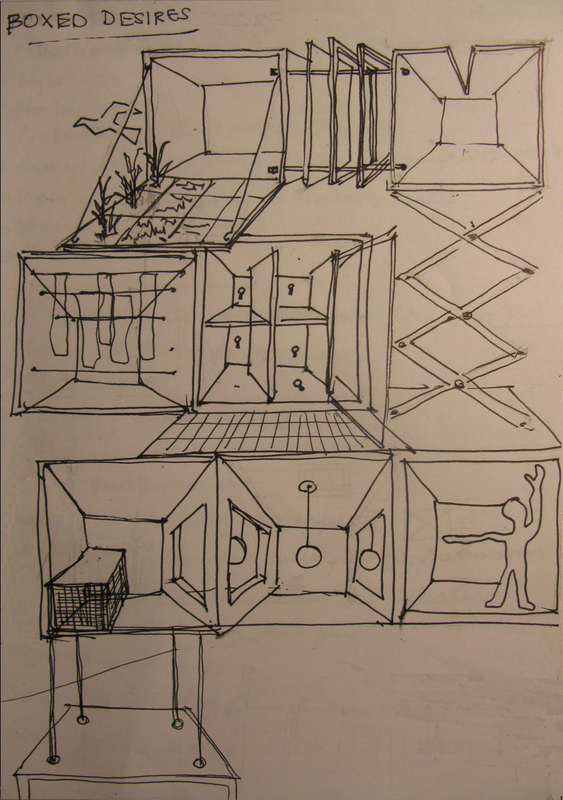 In a diametrically opposite view, the SRS scheme in the 1990s begins to see the slum as a bounded space which can be easily be reconfigured. The scheme seeks to flatten the complex tenure systems and organizational patterns existing in the slum and does not even manage to replace the number of houses it pulls down creating a further dearth of affordable housing in the space starved city. It is important to note that the slum dwellers who were evicted were supposed to be the “unregularized” slum dwellers who came to live in the slums after 1995 and were not entitled to free housing under the SRS scheme. However 1/4th of the residents evicted turned out to be regularized slum dwellers who had documents to prove their entitlement prior to 1995. The state completely disregarded the documents and demolished the slums anyway. Incidents like this highlight that to secure ones space in the city, it is not enough to possess the correct documents, one had to live in a space that “looks formal”. One has a greater chance to resist displacement if in addition to entitled property tenure he/she lives in a place that possesses an “aesthetic of formality”. The SRS scheme promises both. This has had self reinforcing effect in support of the scheme. Those who were entitled further pushed for owning houses through the SRS schemes. Those who were not, scrambled to produce illegal documents that bought them the right. The State’s scheme does not addressed the “slum problem” in Indian cities and has probably exacerbated the problem of affordable housing for the poor even further. What it has managed to do is to create a stronger aspiration for formal housing within the city and a further stigmatization of the slum space. Pugh, Cedric. “The World Bank and Urban Shelter in Bombay.” Habitat International 13.3 (1989) : page 27. Dhar vs Delhi, Supreme court of India. Weinstein, Liza, and Xuefei Ren. “The Changing Right to the City: Urban Renewal and Housing Rights in Globalizing Shanghai and Mumbai.” City & Community 8.4 (2009) : page 423. Print.